Ten days driving through the land of fire and ice gave my mom and I endless possibilities of things to do while in Iceland. I knew early on that glacier exploring was high on my list of things to do. Glaciers cover over 11% of the land in Iceland and have such a dramatic impact on the landscape of this small country. Before our trip I did some research on guiding companies in the area, looking specially for local boutique operations that cater to smaller groups. Asgard Beyond was the perfect fit for us - a guiding company that was started by old friends with a combined experience of over 60 years working as guides and instructors in the tourism industry throughout Iceland and Greenland. 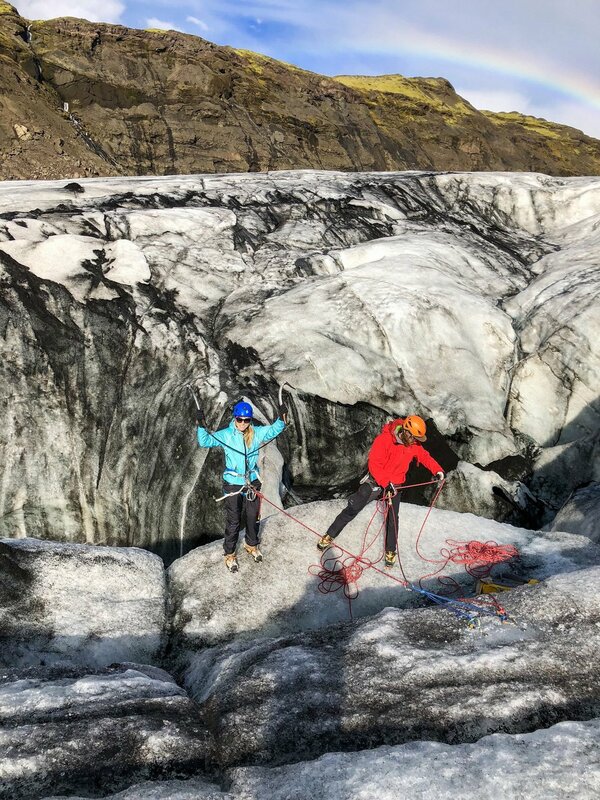 We decided to go with a combined day tour of hiking and ice climbing on the Sólheimajökull Glacier. The Sólheimajökull Glacier is an outlet glacier descending from Mýrdalsjökull, the country's fourth largest ice cap, located on the South Coast of Iceland and only 158 kilometers (98 miles) from Reykjavík. 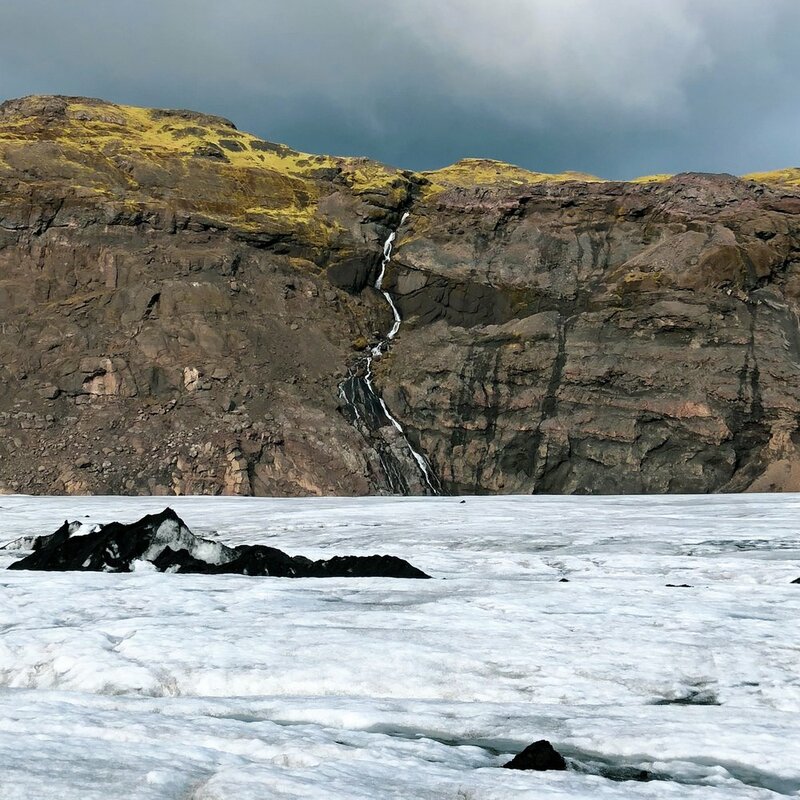 The Sólheimajökull Glacier is popular among tourists because of its easy access however it is not recommended that people walk on the glacier without a guide or proper equipment for safety reasons. Visitors that don’t have the appropriate equipment or a guide can walk along the nearby path for views of the outlet and glacier lagoon. My mom and I were touring Iceland by van and had already left Reykjavík so we met our guide at the Sólheimajökull parking lot (although Asgard does provide pick up and transportation from Reykjavík if requested). Asgard tours are small groups with a 4:1 guest to guide ratio. A group this size provides guests with a more intimate experience and chance to learn more skills in a less overwhelming environment. After meeting our other two group members and our guide, Iggy, a native to Iceland, we geared up and started the short walk to the edge of the glacier. We stopped at the beginning of the lagoon to put on our crampons and quickly go over how to use our gear. After a rundown of best practices we headed towards the narrow trail that lead up onto the glacier. As we passed two large groups of close to twenty people we all said aloud how glad we were to be in a small group. Along the way Iggy would stop to point out different characteristics or things to notice about the glacier. Iggy noted that since most glaciers in Iceland are on active volcanos black sand or ash is common to see. Apparently several dust storms also happen in Iceland every year depositing dust and/or ash on the ice caps. The effects of climate charge were hard to ignore on this ever-changing glacier. In the last 10 years the Sólheimajökull outlet glacier has retreated close to 1000 meters. Scientists have discovered though that when a thick layer of dust or ash piles up different parts of the glaciers it actually acts as insulation, slowing down the melt. There are a few other things that separate Sólheimajökull from other glaciers. It’s a unique glacier in the sense that it is not surround by lots of tall mountains, instead it has rocky hills along the side that are lush with green vegetation and waterfalls. It’s very easy to find, just a few miles off of Ring Road, and since it’s not surrounded by mountains you get great views of the South Coast while exploring the glacier. There are also many crevasses with deep ice walls making it great for ice climbing. After we hiked around different parts of the glacier for about an hour and a half we headed towards several large crevasses to start the real fun of the day. Iggy determined where would be the best and safest location for our group to try out a beginner climb. After Iggy set up a top rope he showed everyone how to use the ice axes and then we each took turns on the low incline wall. We each had an easy go at the beginner wall and were ready to move onto something more challenging. We relocated to a large, deep crevasse where we took turns being lowered down as far as we each felt comfortable and then climbed back up. My mom and I had both ice climbed previously on waterfalls, although it had been quite a while for both us. I’d like to think we were a little prepared but it turns out ice climbing on a glacier is a lot different than on a waterfall. The ice crumbles differently and I had forgotten how much you use different muscles than when rock climbing. I slowly climbed up the icy face, taking a surprising fall a couple of times. My arms were pumped and my adrenaline was flowing but when when I reached the top I just wanted to rappel back down and do it all over again. Exploring the ice with my mom and seeing firsthand the effects of climate change was quite the experience. We both left eager to learn more about the area and were mentally planning when we would make our next trip back to Iceland. There’s a lot of ways you can adventure when visiting a new country but I personally think that one of the best ways is to try something different. Maybe try something that’s a little wild and outside of your comfort zone, odds are you won’t regret it. We had an awesome time exploring the Sólheimajökull glacier and Iggy and the whole Asgard team couldn’t have been better hosts. My mom and I both really appreciated Iggy’s professionalism, guidance, and knowledge about the area. Many thanks to Asgard Beyond for having us! This post was sponsored by Asgard Beyond.